When Razor is poisoned by Dr. Viper, T-Bone must think on his feet to save his friend’s life. Summary: When Razor is poisoned by Dr. Viper, T-Bone must think on his feet to save his friend’s life. Kai: (grins) Well, here it is, my first Swat Kats fan fic! Kai: (rolls eyes) Ahh… thanks, Spike. Razor: Something else to torture your writing class teacher. Kai? T-Bone: Na, Sure Shot, I think it’s she’s just going for the ‘Fan girl feels like torturing favorite character which means you, Razor. T-Bone: (shifty-eyed) Right, you didn’t hear that, okay. T-Bone: (glares at Razor) Why I outta cream you one, Razor. Kai: (Huggles Razor) Well, you can’t because I’ve all ready got dibs on him! Yami Bakura: What, you mean like you, Kai? Kai: (Hits Yami Bakura with a two ton mallet) Bite me. Kai: (rolls eyes) Not you, stupid… As usual, I don’t own anything except for myself. So, no suing!!! Yami Kai: (points to above statement) And, I’m selling her for top dollar! Razor: On with the fic! Jake smiled as he took a big gulp of water. He and Chance were just beginning to enjoy their well deserved break at the junk yard when the alarm went off, signaling there was evil afoot in Megakat city. 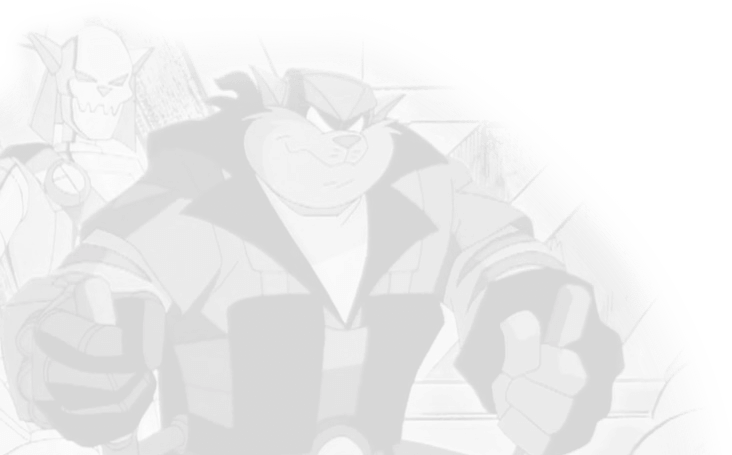 “Razor, someone’s broken into Megakat Labs,” Callie’s voice stated over the intercom. “Doesn’t he ever know when to quit?” T-Bone asked as they flew over the city towards their destination. T-Bone laughed. “Guess not,” he said, bringing the jet down on the rooftop of the lab. Once they had landed, the two kats jumped out and looked around for the best point of entry. “Yeah, you too, Razor,” T-Bone said, but Razor was already out of earshot, so he probably didn’t hear him. T-Bone suddenly shivered as if someone had walked over his grave. I’ve got a bad feeling about this, he thought to himself as he followed his partner down the ductwork. I just hope Feral doesn’t decide to show up. “What do you mean that slime, Dr. Viper, has broken into Megakat Labs?” Feral yelled at one of his officers. Razor crept quietly through the darkened hallways of the labs in search of the two voices he had been listening to for about 20 minutes. “Would you stop messing with every chemical in the room and just grab what you need?” a deep voice questioned as the sound of glass shattering reached Razor’s ears. “Dark Kat and Dr. Viper,” Razor muttered a bit too loudly because the noise caused the two villains to spin around and scan the room for an intruder. “Get him!” Dark Kat shouted as a few Creeplings appeared from the shadows. 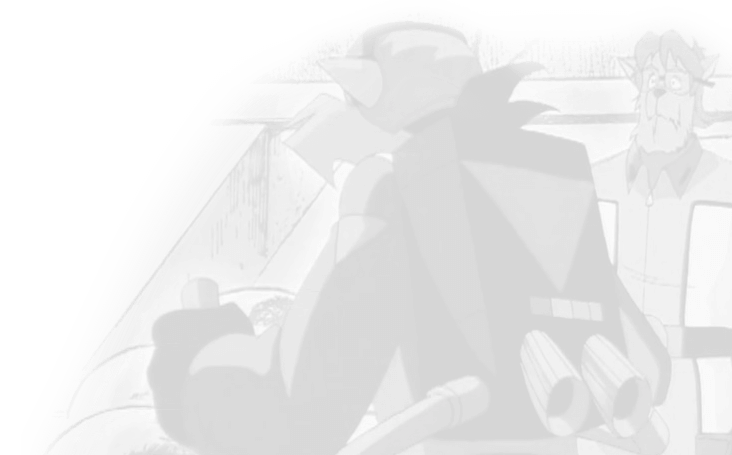 “Crud, time to go!” Razor announced as he scrambled to his feet in the direction of the doorway only to find his way blocked by Dr. Viper. “Lost, Swat Kat?” Dr. Viper sneered as Razor took a step back and bumped into Dark Kat. Dark Kat grabbed Razor by his throat. “We should get rid of him, Viper, before his friend decides to show up,” he stated, tightening his grip on Razor, causing him to make gagging noises. Razor’s eyes shifted back and forth from the vial to Dr. Viper. He had a feeling that whatever was in that vial was not going to be good for him, and he was determined not to swallow any of it. Come on T-Bone, anytime you wanna show up, he thought to himself as he struggled to get out of Dark Kat’s grasp. “Stop squirming!” Viper shouted angrily as he tried to shove in the vial in Razor’s mouth. “Razor!” a familiar voice shouted as a figure appeared in the doorway. Razor glanced in the direction of the doorway to see T-Bone standing there. “T-Bone, it’s about time you got…,” his voice trailed off due to the vial being stuck in his mouth by Viper. And, with that, the pair disappeared into the shadows of a smoke screen. Razor attempted to respond, but before he could, the room began to spin and Razor passed out on the floor. “I see your friend managed to let Dr. Viper and Dark Kat escape,” Feral stated as he walked towards T-Bone. Feral let out a laugh like what T-Bone said was the funniest thing in the world. “Yes, I’m sure you have plenty of other things to worry about,” he agreed. “Like how to save your sick friend.” And, with that, Feral got into his helicopter and took off. T-Bone raised an eyebrow to Feral’s statement. How does he know about the poison?, he thought to himself as he set Razor in the cockpit of the Turbokat gently and then got in himself, firing up the engines in the process. Something smells like bad tuna here. Kai: Well, there’s chapter numor 1! I hope you enjoyed it! Spike: There yah go, Lov, makin’ up words again. Kai: (glares) Very funny, Razor. Kai: Nicely said T-Bone only let’s try for a little less complicated next time.